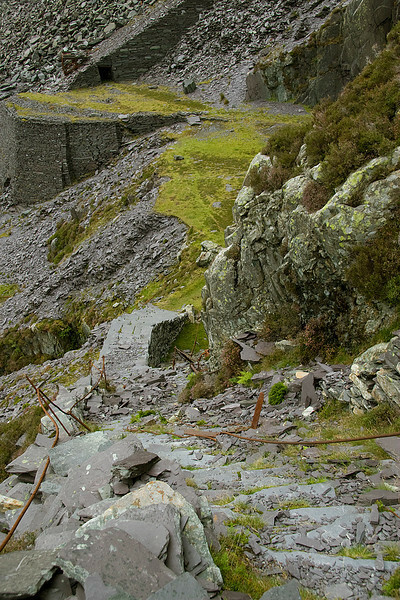 The disused Dinorwic slate quarries dominate the landscape in Llanberis. After closure in 1968 many of the small locomotives which worked the quarry found new homes on the various narrow guage lines around the UK, bu tmuch of the equpiment was left in place (save for removal of copper, brass and lead) as the scrap value wasn't worth recovery. The CEGB took over the land to develop a pumped storage Hydro electric schem and many of the lower workings were tidied up, and lansdcaped. Even some of the upper levels have been heavily modified by construction of an access road, however for the adventurous and above all, careful, there is much to see, even from the public path which runs through the quarry. Quarry workings are dangerous places - especially where there has been no maintenance for nearly 50 years - you have been warned! !.